Bugaboo. Bjorn. Glider. Thanks to all of the baby showers that I have been attending lately, I have added quite a few new words to my vocabulary. You can always pick out the guests at these parties who, like myself, do not have any children. They are the ones who sit through the opening of presents with a consistent “What the heck is that for?” expression on their faces, saying absolutely nothing as the other guests tell gift-relevant anecdotes and give advice to the mom-to-be. During the brunch/luncheon/tea portion of the event, the silence usually continues, try as I may to come up with something to add to the conversation about so-and-so’s toddler’s latest adventure. I mean, what am I going to say? “Oh, my rottweiler did the very same thing.” Somehow, I don’t think that would go over well. So, I usually just focus on my food, smile, and chew very slowly. Don’t get me wrong. I do enjoy baby showers–especially if they are for a good friend of mine–although I can’t help but feel a bit out of place. That is one of the reasons why I am always more than happy to take care of all of the food preparation for the event. It provides me with responsibilities to tend to if I start to feel like I am not adding much value to the heated debate about Huggies vs. Pampers. I have a valid excuse to slip away and put out more cupcakes and tea sandwiches. I also enjoy doing the food for baby showers–or any event for that matter–because it is a great outlet for my creativity. Nothing pleases me more than spending an afternoon hunched over several dozen freshly baked buttery sugar cookies or a two-tiered cake, holding my piping bag and crafting desserts appropriate for a certain theme (my husband thinks I am nuts.) Yes, my back usually kills the next day, and it’s probably not great for my posture, but the end result is more than worth it. 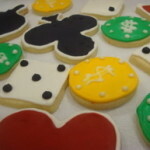 Once decorated, the cookies can be stored at room temperature, tightly covered, for 3-4 days. If you are going to stack the cookies in layers, divide the layers using parchment paper or waxed paper. The prepared cookie dough can be refrigerated for up to 5 days, tightly wrapped with plastic wrap. When you “flood” the cookies, you are filling the insides of the piped borders. The consistency should be quite thin and pourable. 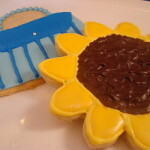 Pipe or drizzle the thinned icing into the center of a cookie, and then use a toothpick or a small knife to guide the icing into the corners and edges. You can keep the royal icing in the refrigerator, tightly covered, for up to 5 days. If you find that the royal icing has become too stiff from sitting out at room temperature, simply mix in a few drops of lemon juice and stir quickly. 3 tablespoons of meringue powder mixed with 1/2 cup water can be used as a substitute for the egg whites if using raw egg whites is an issue. In the bowl of an electric mixer fitted with the paddle attachment cream the butter and sugar on medium-high speed until light and fluffy. Add the egg, egg yolk, vanilla, and orange zest and beat until well combined, scraping down the sides of the bowl as necessary. In a medium bowl, whisk together the flour and the salt. With the mixer on low speed, slowly add the flour mixture, mixing until just combined. Turn the dough out onto a work surface and divide it into 4 pieces. Shape each piece into a disk, wrap each disk in plastic, and refrigerate for at least 1 hour. Preheat the oven to 350F degrees. On a lightly floured work surface, roll the dough out to an 1/8-inch thickness. Cut the dough into “onesie” shapes, and transfer the shapes to baking sheets lined with parchment paper. Bake the cookies for 9-11 minutes, until they are lightly golden brown. Transfer to a wire rack to cool completely. Prepare the icing: In the bowl of an electric mixer fitted with the paddle attachment, beat the egg whites at medium speed until soft peaks form. On medium-low speed, gradually add the confectioner’s sugar, beating the mixture until stiff peaks form. Thin the mixture to your desired decorating consistency using lemon juice, and color with your desired choice of food coloring or gel paste. Decorate the cookies: Using a stiffer consistency and a small round tip (#2 or #3), pipe an outline around the onesie shape and let dry. 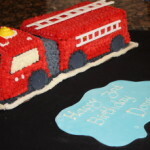 Thin the icing to a “flooding” consistency, and fill the insides of the borders with the thinned icing; let dry. Using stiffer icing, decorate the onesie as desired, making sleeves, collars, etc. Let dry and serve! Julie, this is such a clever idea. The cookies are really darling. Wow – they’re SO cute! You’re an awesome friend – they look like they cost $7 each from a bakery! Oh my gosh, these look fantastic! Great job on the cookies, Julie. They are SO cute. These are the most adorable cookies I have ever seen! Do you have a cookie cutter or did you trace each one individually? Thanks so much, Karen (and everyone)! I actually bought the cutter off of http://www.sugarcraft.com . They are a great resource for all kinds of baking supplies at a reasonable price, but I usually wait to order until I need quite a few things–shipping can add on some $$. These are so precious. I totally hear you with the “out of place” feeling. It’s quite an awkward experience at times. Baking seems like the perfect way to contribute to a baby shower! Did you freehand these onesies, use a bit of parchment, or did you have a cookie cutter? They look so perfect! Next time one of my friends gets pregnant, I’m going to make these! They’re so cute! And congrats to the winners! Actually, you’d be surprised how many situations where “Oh, my rottweiler did the very same thing” is an appropriate response. These are, however, the cutest cookies I think I’ve ever seen. I honestly don’t think I’d have the patience to make one of them, let alone a whole batch. You’ve got the magic touch, although, my rottweiler did the very same thing once. Did you free hand the cutting or do you have a cookie cutter that shape? Oops, my first comment got deleted. I was going to say how cute these are and I will be making these in blue for my daughter’s showers this summer. That is, IF I can pull it off because I am not very talented in the cake/cookie decorating department. Great job! These are the most adorable cookies I have ever seen! You had better start selling them! I don’t “do” baby showers anymore, so I guess I will have to eat them all myself. I am in a no bridal, no baby shower zone at 44. Been there, done that! I politely decline and send a gift. oh, and those shower games!!!!! I am scared just thinking about them! The only words for these are adorable and precious, which everyone else has already said! 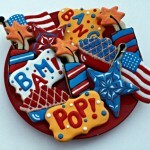 You definitely have the knack for decorating cookies…Martha Stewart would be proud! Thanks for sharing them with us.